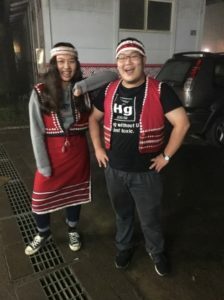 The Saisiyat, also called Sàixià in Chinese, live in Hsinchu and Miaoli, cities in western Taiwan, and they are one of the indigenous peoples of the island. To highlight the traditions of these Aboriginals, we can start from the pas-ta’ay, their grand ceremony, which lasts for three days and three nights. Although the tradition is gradually disappearing, it is a significant rite that every Saisiyat takes part in, and they are therefore trying to find a solution to save it. When we talk about the Saisiyat, we immediately think of the pas-ta’ay, which is their most important and traditional festival, held once every two years. 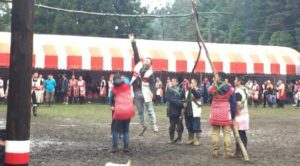 Compared to most of the ceremonies celebrating other indigenous peoples in Taiwan, the pas-ta’ay is more formal and serious. Besides, there is a myth linked to the pas-ta’ay, which is about the love-hate relationship between Saisiyat and Ta’ay people, who taught the Saisiyat how to work in the fields. The pas-ta’ay was in fact originally held to show the Saisiyat’s appreciation towards the Ta’ay; however, the Ta’ay had the ‘bad habit’ of flirting with Saisiyat women. The Saisiyat couldn’t bear this behaviour, and, as a consequence, the leader of the Saisiyat devised a plan to eliminate the Ta’ay. The Ta’ay survived though and in return put a curse on the Saisiyat ― if the Saisiyat didn’t apologize sincerely to the Ta’ay, the crop would fail for a year. What do the Saisiyat exactly do for the three days and three nights of the pas-ta’ay? The whole ceremony is divided in three parts: the Ta’ay are first welcomed, then entertained and finally dismissed. The Saisiyat need to keep dancing and singing for three days, and to prepare glutinous rice and meat to sacrifice to the Ta’ay. On the first day, the welcoming of the Ta’ay starts with a drink among the Saisiyat leaders of the north and the south. While preparing rice cakes, fish, meat and spring water for the Ta’ay, everyone has to wear the traditional costume, sing a song which is only for the festival and dance with a special instrument called buttocks bell of Saisiyat from midnight to the next morning. On the second day, people gather in a circle and dance hand in hand to entertain the Ta’ay. The style of choreography is said to be based on the interaction between the Saisiyat and the Ta’ay. For instance, quick steps represent the Ta’ay taking the Saisiyat to the fields, by contrast, its steps gradually slow down at the sad part of the story. During the performance, everyone wears the buttocks bell. On the final day— the dismissal of the Ta’ay – people go to the riverside, tie miscanthus to a hazel branch, and place the branch high up; a young man has then to jump to take the miscanthus off the branch and then break the hazel branch and throw it eastwards to signify the expulsion of the Ta’ay from their home (in the picture). In fact, nowadays, most of the young Saisiyat neither speak the Saisiyat language nor are familiar with the Saisiyat culture. Even the leader of the Saisiyat’s daughter studies in another city and only occasionally travels back home for the weekend; hence she can’t understand her people’s language anymore. Shao Peng Feng, an expert in Saisiyat history and culture, said that the first step is to keep the ceremony and the language intact, so that young people will have a clear structure to follow. The second is to participate, encouraging the younger generations to go back and take part in the activities. The more are the opportunities to familiarize with the traditions, the more youths are likely to engage in them. And last but not least, to make understand, making sure the younger generations get to know the meanings and backgrounds of the traditions, not just blindly follow the orders of the elderlies. Facing the potential disappearing of their traditions, the leader of the Saisiyat said that saving their culture is a long term goal for him, and he is committed to carry on until everybody in the world knows who the Saisiyat are.